In this case report, a 67-year-old patient twice underwent closed reduction of a dislocating dual-mobility implant in the emergency room. 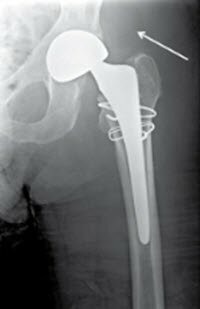 When surgeons finally revised the hip, they found the polyethylene liner had completely dissociated from the femoral head. Introduced in 1974 by Bousquet, the dual-mobility bearing for use in total hip arthroplasty (THA) confers increased jump distance and improved overall stability relative to conventional THA designs [1-3]. The dual-mobility bearing incorporates a relatively small (22- to 28-mm) metal or ceramic femoral head press fit into a larger polyethylene liner that articulates with the acetabular component. Dissociation of the femoral head from the polyethylene liner (intraprosthetic dislocation) is a known late complication thought to be related to polyethylene liner wear and has been previously reported [2-7]. In a consecutive series of 384 primary THAs employing Bousquet’s original design, there were 14 intraprosthetic dislocations over 15 years (3.6%). The authors cited polyethylene wear as causative and mean time to intraprosthetic dislocation was 8.9 years . A recent investigation by Hamadouche et al reported a 2.4% rate of intraprosthetic dislocation among 168 consecutive primary THAs followed for a minimum of 5-years . The dislocations occurred at a mean 5.9 years and were thought to be secondary to wear at the mobile insert. A case report from the UK describes an intraprosthetic dislocation of a dual-mobility implant occurring 1.5 years after primary THA . There have been no reports in North America of early intraprosthetic dislocation following use of dual mobility implants for primary THA. 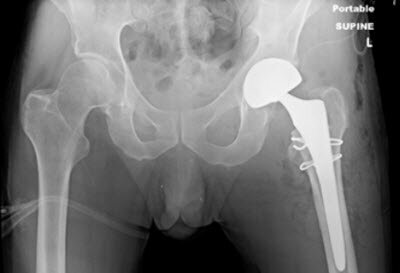 Three recent case reports describe early (within 14 months) intraprosthetic dislocation of the dual-mobility implants following attempted closed reduction of an ipsilateral hip dislocation [4,6-7]. The reports, however, concern patients in whom the dual-mobility head was used in an off-label, mix-and-match fashion to revise an existing THA with retention of either the femoral stem  or acetabular cup [4,6]. We present a case of a patient with intraprosthetic dislocation following attempted closed reduction of a primarily implanted dual-mobility THA. To our knowledge, this is the first case of early intraprosthetic dislocation of a primary dual-mobility implant to be reported in North America. The purpose of the current report is to increase awareness of intraprosthetic dislocation and mitigate its risk by recommending that orthopaedic surgeons be involved with any attempted reduction of dual-mobility implants. A 67-year-old-man with a history of cerebral palsy (CP) presented to an outside hospital after a fall onto his left hip while attempting to rise from a chair. Prior to the fall, the patient was a community ambulator. Roentgenograms revealed a displaced, comminuted femoral neck fracture and the patient was transferred to a trauma center for definitive management. The orthopaedic consult took place 24 hours after original injury. A THA was recommended based on the timing and the patient’s pre-injury functional status. Due to his history of CP, it was felt that use of a large head with dual mobility would minimize his risk of dislocation. The patient subsequently underwent primary THA utilizing a posterior approach with implantation of a 56-mm press-fit cobalt chrome acetabular shell in anatomic anteversion and a 28-mm diameter ceramic femoral head with a 50-mm polyethylene insert (Anatomic Dual-Mobility X3; Stryker, Mahwah, New Jersey) (Figure 1). Figures 1a-b. Postoperative anteroposterior (A, top) and cross-table lateral (B, bottom) views of the hip. Grade 3-4 degenerative changes were found anteriorly and superiorly on the femoral head. Additionally, two luque wires were placed proximal and distal to the lesser trochanter for fracture prophylaxis per the surgeon’s routine for hip fracture patients undergoing arthroplasty. The polyethylene and ceramic head were assembled with implant-specific tools according to the manufacture’s specifications. The hip was noted to be stable intraoperatively with flexion to 90 degrees, adduction to 20 degrees, and internal rotation to 80 degrees with no impingement or subluxation. Both the posterior capsule and short external rotators were repaired. The patient had an uneventful postoperative course and was discharged on hospital day 5. On postoperative day 26, the patient presented to the emergency department with left hip pain and inability to bear weight subsequent to a fall out of bed onto his left hip. Imaging revealed a posterior dislocation of the left hip. On initial dislocation films, the poly head can be visualized in place on the ceramic femoral head (Figure 2). Emergency medicine physicians performed closed reduction under conscious sedation. Figure 2. Anteroposterior pelvic film after initial dislocation. The poly head can be visualized in place on the ceramic femoral head. Post-reduction roentgenograms were read as normal. Retrospective review demonstrates an eccentrically located femoral head and a circular radiolucency overlying the left gluteal musculature (Figure 3). The patient was discharged with instructions to bear weight as tolerated, limiting hip flexion to less than 70 degrees. Figure 3. Anteroposterior hip film after reduction. Note the eccentrically located femoral head and a circular radiolucency of poly head overlying the left gluteal musculature (identified by the arrow). Six weeks after the index procedure, the patient again presented to the emergency department with left hip pain and inability to bear weight after attempting to get into a car. Plain imaging revealed a posterior hip dislocation with the prosthetic head superior and posterior to the acetabular component (Figure 4). Figure 4. Anteroposterior pelvic films after the posterior hip dislocation with the prosthetic head superior and posterior to the acetabular component. The patient underwent closed reduction under conscious sedation with subsequent relocation of the hip in the emergency room. Post-reduction films were notable for an eccentric position of the femoral head within the acetabular component in addition to a spherical lucency posterior to the acetabulum confirming an intraprosthetic dislocation (Figure 5). Figure 5. Anteroposterior hip films after reduction. Note the eccentric position of the femoral head within the acetabular component in addition to a spherical lucency posterior to the acetabulum confirming an intraprosthetic dislocation (identified by the arrow). The patient returned to the operating room for revision THA. Intraoperatively, the polyethylene liner was identified within the gluteal musculature, completely dissociated from the femoral head. A trial was done with existing components and the hip was found to be stable with flexion to 90 degrees, adduction to 20 degrees, and internal rotation to 70 degrees, with no obvious component failure. Due to concern for damage to the cobalt chrome acetabular shell and ceramic head from articulation over the previous weeks, both the femoral head and acetabular components were revised using a 58-mm press-fit cobalt chrome acetabular shell and 28-mm outer diameter ceramic femoral head with a 52-mm polyethylene insert (Anatomic Dual-Mobility X3; Stryker, Mahwah, New Jersey). The CoCr shell was placed with an additional 10 degrees of anteversion and the patient had a stable intraoperative exam. The patient tolerated the procedure well but his postoperative course was complicated by sigmoid volvulus. This resulted in an emergent exploratory laparotomy, a prolonged course in the SICU from which the patient did not recover, and ultimately the death of the patient on postoperative day 79 from the index procedure. This is the first case of early intraprosthetic dislocation of a primary dual-mobility implant to be reported in North America. Previous literature has suggested restricting the use of dual-mobility components in primary THA to patients at increased risk for dislocation (ie, patients >75 years of age, those with neuromuscular or cognitive disorders, and those having an ASA score ≥3) . A dual-mobility implant was therefore chosen for this patient with CP, who was at higher risk for dislocation. Our institution has flat cap pricing contracts and we occasionally use this device in patients felt to have an increased risk of instability. The patient’s diagnosis of CP is material to the current discussion, as the risk of THA dislocation is higher in patients with CP . While there have been no large case series analyzing the incidence of dual-mobility THA dislocation in patients with CP, a retrospective cohort of 8 patients (10 hips) treated with dual-mobility designs reported no dislocations at an average follow-up of 39 months . The posterior approach was utilized in this patient according to the preference of the primary surgeon. An anterior or anterior lateral approach can be considered in patients with increased dislocation risk. However, in a retrospective review of 228 THA revisions in the Swedish Hip Arthroplasty Register using dual-mobility implants, 56% were performed through a posterior approach with no increased incidence of dislocation in this cohort relative to other approaches . Philippot et al recently postulated three mechanisms of intraprosthetic dislocation after analysis of 81 such cases from a series of 1,960 primary dual-mobility THAs implanted between 1985 and 1998 . Type I “pure” dislocation results from wear of the polyethylene retentive rim in an otherwise functional prosthesis. This accounted for 32% of cases. Type II occurs secondary to extrinsic blocking of the polyethylene liner, for example, by arthrofibrosis or heterotopic ossification. They classified 51% of dislocations as Type II. Type III is characterized by cup loosening and accounted for 17% of intraprosthetic dislocations. Notably, each of these mechanisms is a late complication with mean onset of 11, 8, and 9 years, respectively. In North America, there are no randomized controlled trials comparing the rate of dislocation among dual-mobility and conventional THA implants. A single non-randomized, retrospective study compared the rate of dislocation of conventional THA and dual-mobility THAs implanted primarily following femoral neck fracture. Among 98 primary THAs at 1 year, there were no dislocations reported in the dual-mobility group compared with 8 of 56 (14%) of the conventional THAs . Moreover, in a recent retrospective comparison of bipolar hemiarthropasty and dual-mobility THA, the authors reported a significantly increased incidence of dislocation among patients treated with bipolar hemiarthroplasty (14.6% vs. 4.5%) . Analogous to the current case, intraprosthetic dislocation of bipolar hemiarthroplasty implants after attempted closed reduction has been described in the French literature . In both cases, bipolar hemiarthroplasty was utilized in treating displaced femoral neck fractures. The authors of this report postulate a “bottle-opener” effect in which the cup engages the posterior acetabular rim and subsequent limb traction results in dislocation of the intraprosthetic joint. It is reasonable to conclude, although no biomechanical studies have been conducted to address this claim, that the “bottle-opener” effect would only be exaggerated when the relatively smooth posterior acetabular rim is replaced with a metal acetabular component. In contradistinction to postulated mechanisms of late intraprosthetic dislocation, the current case was likely a direct result of attempted closed reduction with subsequent impingement of the polyethylene head on the acetabular component. The aforementioned case report by Banzhof et al describes this impingement mechanism leading to early intraprosthetic dislocation following attempted closed reduction . We advise caution with any attempt at closed reduction of dual-mobility implants. In many communities emergency room physicians routinely perform closed reduction of dislocated THAs under sedation without consulting orthopaedics. For patients with a dual-mobility implant and THA dislocation, an orthopaedic surgeon should perform the reduction attempt under general anesthesia with complete muscle relaxation using fluoroscopy. Although an intraprosthetic dislocation could still occur in this setting the risk would be reduced, recognition of the complication immediate, and it would allow for an open reduction under the same anesthetic if required. We recommend advising patients with dual-mobility implants to involve orthopaedic surgeons in any attempted reduction of a THA dislocation to mitigate the risk on an intraprosthetic dislocation. Scott B. Marston, MD, and Ryan D. Horazdovsky, MD, are from the Department of Orthopaedic Surgery, Regions Hospital, St. Paul, Minnesota. Joseph D. Schirmers, MD, is from the Department of Orthopaedic Surgery, University of Minnesota School of Medicine, Minneapolis, Minnesota. 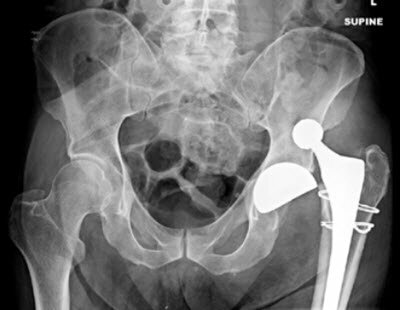 Schirmers J, Horazdovsky R, Marston S. Early Intraprosthetic dislocation of dual-mobility total hip arthroplasty implant following attempted closed reduction: a case report. Reconstructive Review, a publication of the Joint Implant Surgery & Research Foundation (JISRF). 2015;5(2)47-50. Copyright 2015 Joseph Schirmers, MD, Ryan Horazdovsky, MD, Scott Marston, MD. This work is licensed under a Creative Commons Attribution-NonCommercial 4.0 International License. Farizon F, de Lavison R, Azoulai JJ, Bousquet G: Results with a cementless alumina-coated cup with dual mobility: A twelve-year follow-up study. Int Orthop 1998, 22(4):219-224. Philippot R, Camilleri JP, Boyer B, Adam P, Farizon F: The use of a dual-articulation acetabular cup system to prevent dislocation after primary total hip arthroplasty: Analysis of 384 cases at a mean follow-up of 15 years. Int Orthop 2009, 33(4):927-932. Philippot R, Adam P, Reckhaus M, et al: Prevention of dislocation in total hip revision surgery using a dual mobility design. Orthop Traumatol Surg Res 2009, 95(6):407-413. Hamadouche M, Arnould H, Bouxin B: Paper 348: Cementless dual mobility socket in primary THA at a mean 7-year follow-up. 79th Annual Meeting Proceedings. Rosemont, IL, American Academy of Orthopaedic Surgeons 2012, pp 541-542. 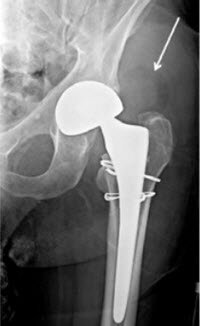 Riviere C, Lavigne M, Alghamdi A, Vendittoli P: Early Failure of Metal-on-Metal Large-Diameter Head Total Hip Arthroplasty Revised with a Dual-Mobility Bearing; A Case Report. JBJS Case Connector 2013 Sep, 3(3):e95 1-6. Ward J, McCardel BR, Hallstrom BR: Complete Dissociation of the Polyethylene Component in a Newly Available Dual-Mobility Bearing Used in Total Hip Arthroplasty; A Case Report. JBJS Case Connector 2013 Sep, 3(3):e94 1-4. Buly RL, Huo M, Root L, Binzer T, Wilson PD, Jr: Total hip arthroplasty in cerebral palsy. Long-term follow-up results. Clin Orthop Res 1993, 296:148-153. Sanders RJ, Swierstra BA, Goosen JH: The use of a dual-mobility concept in total hip arthroplasty patients with spastic disorders: No dislocations in a series of ten cases at midterm follow-up. Arch Orthop Trauma Surg 2013 Jul, 133(7):1011-1016. Hailer NP, Weiss RJ, Stark A, Kärrholm J: Dual-mobility cups for revision due to instability are associated with a low rate of re-revisions due to dislocation: 228 patients from the Swedish Hip Arthroplasty Register. Acta Orthop 2012 Dec, 83(6):566-571. Philippot R, Boyer B, Farizon F: Intraprosthetic dislocation: a specific complication of the dual-mobility system. Clin Orthop Relat Res 2013 Mar, 471(3):965-970. Epub 2012 Oct 10. Tarasevicius S, Busevicius M, Robertsson O, Wingstrand H: Dual mobility cup reduces dislocation rate after arthroplasty for femoral neck fracture. BMC Musculoskelet Disord 2010, 11:175. Bensen AS, Jakobsen T, Krarup N: Dual mobility cup reduces dislocation and reoperation when used to treat displaced femoral neck fractures. Int Orthop 2014 Jun, 38(6):1241-1245. 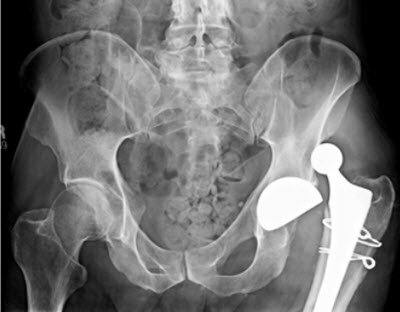 Loubignac F, Boissier F: Cup dissociation after reduction of a dislocated hip hemiarthroplasty. Rev Chir Orthop Reparatrice Appar Mot 1997, 83(5):469-472.